I have just received the latest RHOCAR mag and there is an item where Dave Thompson has reported a very serious safety issue with his EXMO. After reading the article I nipped into the garage and had a look at mine and found exactly the same potentially disastrous problem! 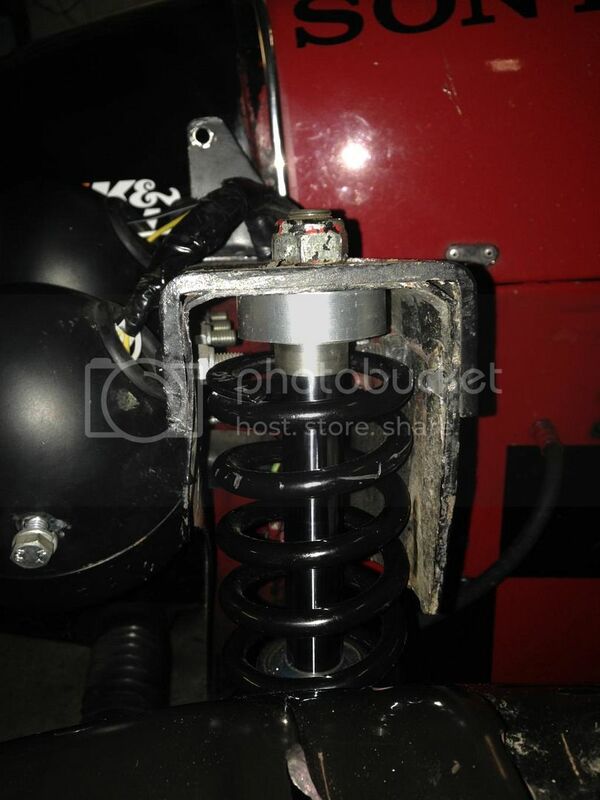 The problem is at the point where the top of the front suspension struts mount through the chassis outriggers. The top of the struts simply bolt through the channel section outriggers so all the load is concentrated on a very small area of 1.6mm thick stainless steel. In my opinion this is a very serious design fault by RHE and if you own an EXMO please check yours now!. On both Dave's and my car there are stress fractures spreading out from the mounting holes, the channel is bowing upwards and the holes have become elongated. 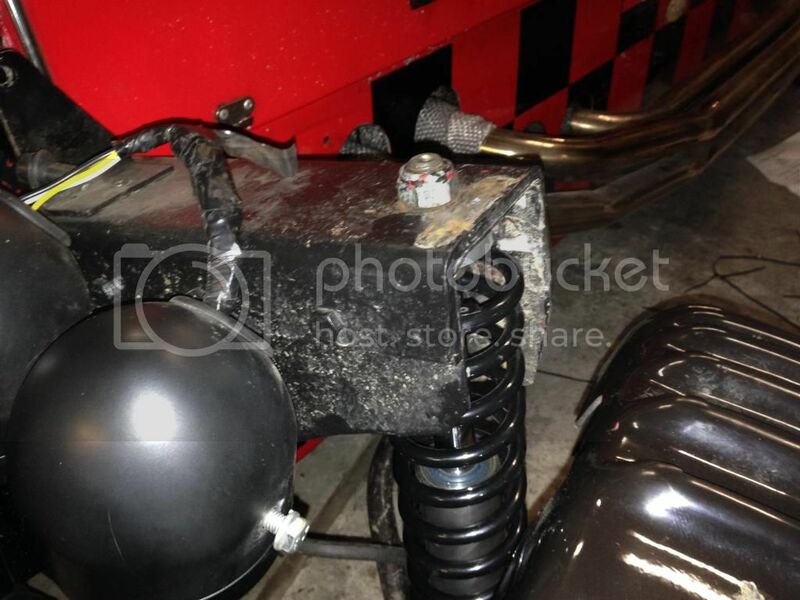 If left unchecked the outrigger will eventually fail, the suspension will collapse and the strut will be forced through the wing as the car hits the road. This could potentially injure or even kill you and anyone else involved if it happens whilst driving hard and lets face it that is when it is most likely to happen rather than when it is parked in the garage. To date I have only covered 8000 miles with no adverse driving or track days etc so if you have an EXMO the chances are you WILL have this problem at some time. 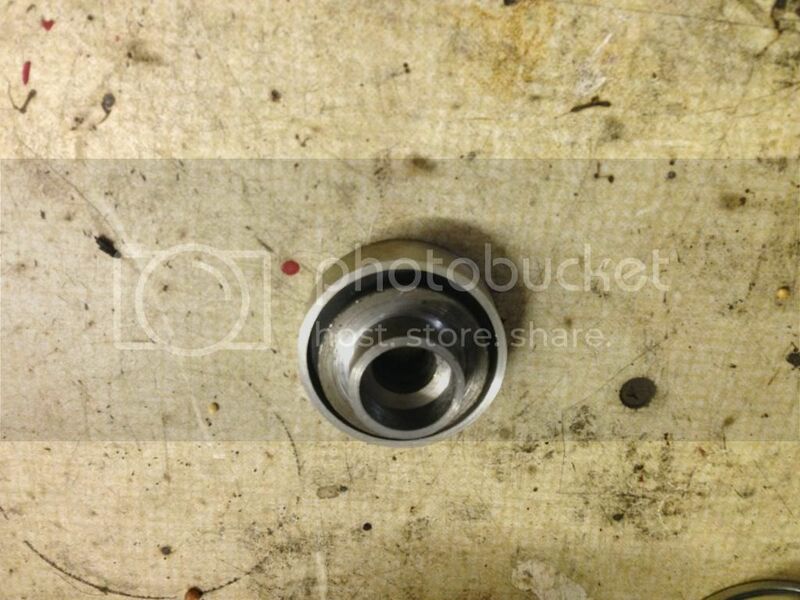 The cheap fix for this is to make yourself a steel plate to spread the load. Although no expert, I suggest using a mild steel plate of 6mm thickness, 70mm wide and 180mm long with a 13mm hole in the dead centre. 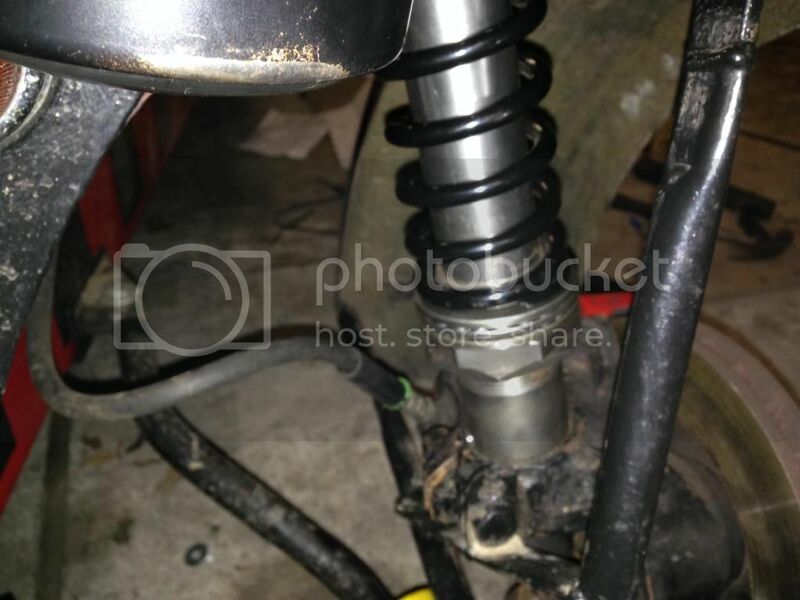 Undo the top suspension mount, jack the car up to lift it off the suspension, fit the plate underneath the outrigger, slide the suspension strut back in place and bolt it up. Dave has used the very nice option of a rose-jointed concentric top suspension mount from Demon Tweeks that he has cut down and modified to fit the outrigger. This is a little expensive at about £150 and involves a lot more work but it looks great and should do the job very nicely. I am reporting this without any prejudice towards RHE, I just want to make sure we are all as safe as possible. Of course both Dave and I could not except any liability if either of our solutions fail but both are a damn site better at spreading the load that the design from RHE. I must thank Dave for bringing this to my attention and I am just passing it on for all to check their cars. So - if you own an EXMO, please go have a look now. It would be very sad to hear of any accidents damaging cars or injuring people caused by this design fault. OK - As promised here are the pics (I hope Dave doesn't mine me using his images - cheers Dave). These pics are not as bad as the state of mine as on my car there are more than 2 cracks and they are more substantial but it illustrates what to look for - CHECK YOURS NOW!! Any chance of some pictures.....? Bit difficult on mine as the wings are still attached. I will try scanning in Daves pics from the club mag tonight, will post if they come out ok. Although I will admit then when building this came up and a lot of owners I know off added an additional plate inside to spread the load/reduce the wear. Where were you in 96! This forum is a wonderful thing - all I had to go on back then was the crappy videos and instinct. The only thing I did notice at the time was the bearings RHE supplied to fit at the top of the struts were for side bearing load Took the bearings from the top of the Sierra struts and used them instead. Cheers for pinning this Matt. Actually I did start running the original forums in 97! But I finished the hood in Feb '96! This also happened to my Exmo just over a year ago. I think it more likly to happen to stainless than zintec. This is because zintec streaches a lot before tearing. Be warned when this happens it happens fast. At 38 thousand miles my suspension tops were OK, I had the tops off as I removed the wings to do a small repair to the fiberglass. At 38700 miles the struts punched through, the suspension does not go splat it sinks giving time to stop, and even drive slowly home about 30 miles. I support your view on the upper locating holes for Exmo front shocks and springs. I have today suffered a "Fail" on a previously un-MOTed Exmo. I will raise a separate note on that failure (rear springs top locating pads) but the kind tester also gave me an "advisory" on the front springs. When the car was raised on a body hoist with suspension x 4 hanging, the tops of the two front suspension points were (a) gapped and ( tending to foul the rear sides of the buttress. I agree - a weakness in design which should be fixed by all Exmo owners. Should someone / I write to GBS to let them know as they may wish to issue an advice note to all original purchasers (I am the 8th. owner of this particular Sierra!!)? Exmo kits must all be 15+ years old now. I doubt GBS have records for the firm three or is it four owners ago and as in your case the original purchaser who may have been in Richard Stewarts files/records is unlikely to be the current owner. This is a problem that resurfaces every now and again to be discussed. Perhaps we could have a new category for posts. Possible safety issues/failures topics. And spread the word about the club and board whenever we meet up with RH owners. 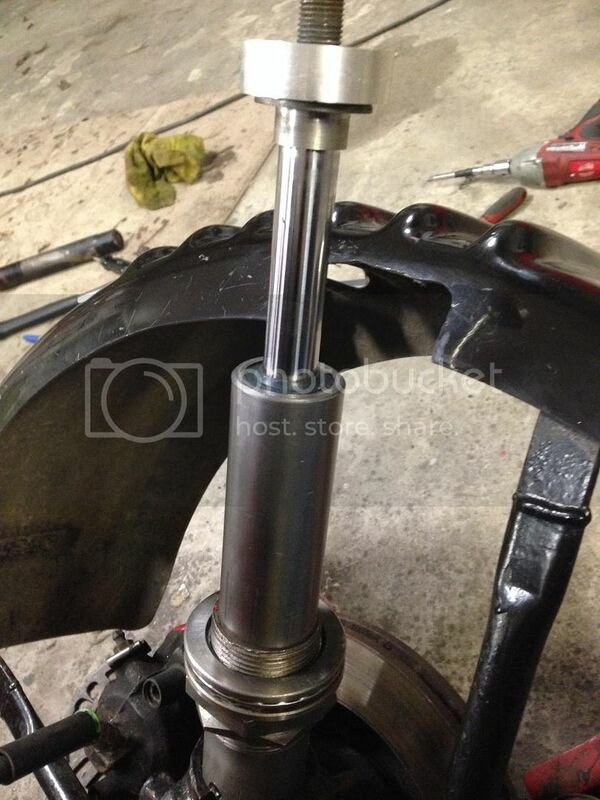 1) The threaded end of the shock absorber piston rod pushes through the top of the buttress and is bolted up tight. The point load placed around the hole of the buttress when on the road is huge and the piston rod either deforms (on mild steel versions) or cracks (s/s version) the top of the buttress as detailed at the start of this thread. At first I used a large diameter thick washer to spread the load but still found a significant degree of deformation and so I resorted to a full 5mm thick steel channel bolted over the top of the buttress. This has worked fine for me. With this setup, the hub and damper rotate around the fixed spring. 3) with the buttress strengthening detailed in item 1, I later discovered that this caused my dampers to leak. This was because the damper needs a small amount of angular movement as it travels up and down its stroke at the top where the piston rod bolts to the buttress. I image that before I strengthened the buttress, the thin buttress material deflected enough to allow this damper angular movement, however with the buttress strengthened, there was no way it would deflect and so the deflection / angular movement moved to the body of the damper where the piston rod enters (around the seal). Obviously this point isn't designed to deflect and as such started leaking. 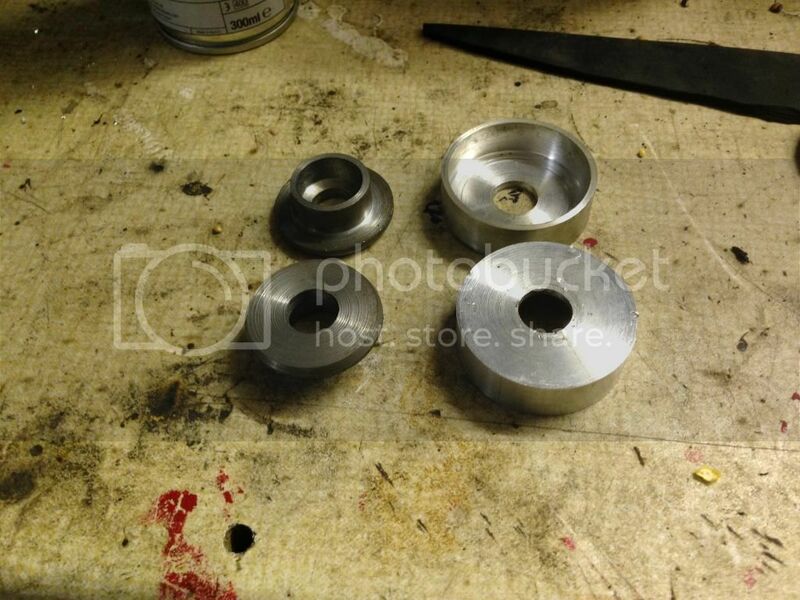 I had to order new damper and this time around, I made an aluminium and rubber bush to go on the end of the damper to allow it the angular movement to take place at the end of the piston rod instead of the damper body. I'm new to Robin Hood's - I have only just purchased my 1998 Exmo yesterday infact. My buttresses are fine at the moment - I had a good look over them from both sides and they are solid but I would like to do some preventative maintenance. Is there any kit or has anyone manufactured any parts to solve this issue? 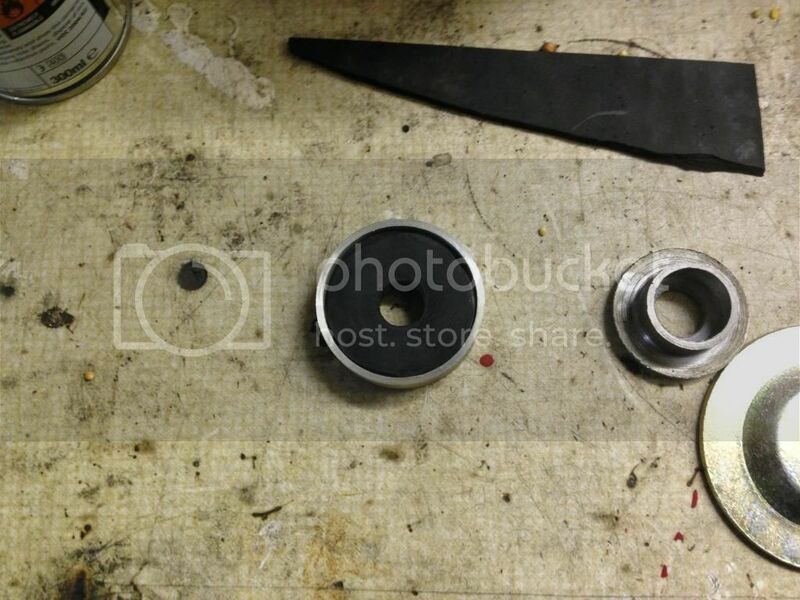 The bearing supplyed is still good after 75000 miles. The butress split, no repair kit has ever been offered as the repair is so simple. You need a spreader plate under the butress I used a plate 10mm thick (material I had available 5mm would be good) the internal width of the butress and about 100mm in the length of the butress with a central hole able to take the strut rod. I see, just thought I'd see if anyone out there had anything made up for it. I will pop down to my local engineers this week and get them to make me something up.